Self-propelled 'microrobots' moving through your bloodstream bringing healing drugs have taken a little step forward with research from Penn State University. The micromotors are composed of spheres measuring less than a micrometer in width. The spheres are divided into halves, with one side made of gold and the other of silica. 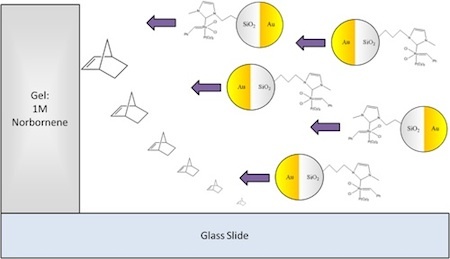 To propel the devices, the scientists attached a molecule known as a Grubbs catalyst to the silica side to cause polymerization. When dropped into a solvent containing norbornene, the motors could be prompted to move forward, depositing a polymer trail in their wake. This research is intended to demonstrate that the basic principle works; Professor Ayusman Sen cautions science fiction fans that "practical applications will take at least a decade." Indeed, sf fans have been eagerly awaiting tiny self-propelled vessels plying the body's waterways (bloodways? fluid-ways?) 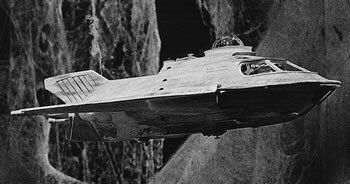 since the 1966 movie Fantastic Voyage.